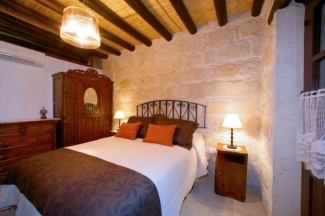 Pinou�s house is a beautiful two storey, stone-built, traditional house, over a hundred years old. 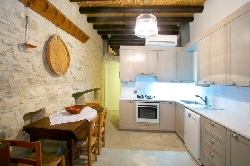 The house is situated in the quiet and picturesque village of Goudi near Polis Chrysochou, in Paphos, Cyprus. It was recently restored and renovated for the purpose of agro tourism. Apart from a large, walled courtyard with a swimming pool, the house has an enticing panoramic view of Chrysochou valley. Relaxing by the private swimming pool, you can enjoy the peace and the tranquility of the surroundings. In the early morning it is ideal to go walking along the stream that passes close to the village. Here you can enjoy nature to the fullest whilst watch different indigenous birds or just walking through the orange groves. The house consists of 3 fully air-conditioned bedrooms (with cooling/heating). There are two double bedrooms, one on the ground floor and another on the first floor. The master bedroom on the first floor has a balcony with beautiful views (two teak chaise-lounge and side table provided). 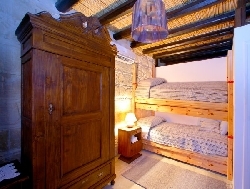 The third bedroom on the first floor with a bunk bed has a traditional wooden balcony overlooking the huge courtyard with the swimming pool. 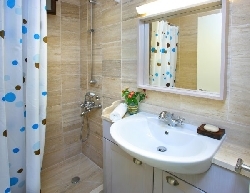 There are two bathrooms, one on each floor, contain a shower with a w.c. . Facility of washing machine is provided on the first floor. Most of the wooden furniture used in the house is antique and was acquired from local antique dealers. The open plan kitchen is fully equipped with a gas cooker, electric oven, fridge-freezer, dishwasher, kettle, toaster, microwave and dining table. 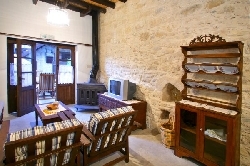 The living room boasts a rustic fireplace and is decorated with antique tools. A television is provided for entertainment during indoor hours. Meals can be best enjoyed by the swimming pool (6,5mx3m solar heated, hydro massage bench) in the courtyard, surrounded by flowers, herbs and aromatic plants. Authentic teak furniture adds a cosy and homely touch to the whole place. There is a teak garden table with chairs under a vine tree and six teak sunbeds with big umbrellas where you can enjoy this private paradise. The location of the house is ideal for those who would like to explore the area. You can visit some of the loveliest beaches on the island within a distance of 8 km only. 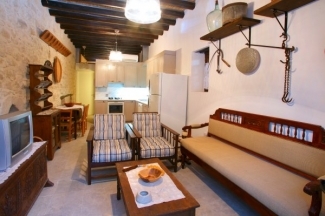 The beauty of traditional villages, antique Byzantine churches and monasteries, can be enjoyed with a short drive from the Pinou�s House. For the adventurous souls, there is the unspoiled Akamas park with many nature trails. 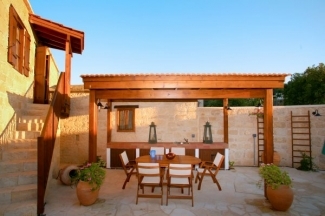 Also is recommended to visit the village of Peyia which houses the Birdpark and the village of Kathikas to experience donkey rides through a gorge. The Latsi fishing shelter where boat trips along the shore can be arranged and the village of Choli with its famous Panayia�s church (15th century), are only few of the many sights that are worth visiting. The nearby villages of Kritou Terra, with its almond trees, Droussia on top of the hill, Neo Chorio with the stunning view of the bay and Lysos next to the forest of Paphos (where the lucky ones may see some of the wild Cypriot Moufflon called �Agrino�), are a great visual and soulful treat. You mustn�t forget to visit the monastery of Panayia Chrysoroyiatissa and buy some local wine there. The chapel of Ayia Ekaterini with the five cupolas and Panayia Chrysolakourna with its beautiful views are a must see. In the village of Phyti, where you can visit and see people making handmade embroideries, tradition and culture of Cyprus can be experienced firsthand.